So this is it. And so soon after the end of Shadows in the Silence, too. I literally may die. I can’t handle this. Even if Cassie is going to be writing like a bajillion more Shadowhunter books. This book starts out much like you might expect: Tessa is trying out a wedding dress, Jem’s in love, Will’s moody because all the women in his life seem to do is vex him and Benedict Lightwood has transformed into a giant bug thing because of demon pox. Oh wait. No, I wasn’t expecting that last bit there. The inciting incident of this novel is, in fact, that Benedict Lightwood has becoming a giant bug demon and that he ate his son in law. Gabriel Lightwood has nowhere to go but the London Institute for help. Charlotte is of course going to give it to him, without telling the Clave because of the shame it would cause the Lightwood family. Let the games begin! Interestingly enough, these events are also interspersed with correspondence between the Clave and the Consul, telling the Consul that they are considering Charlotte as the new Consul. The characters have no idea this is going on, but we get a sense that the Consul has bad plans for Charlotte to keep her from getting his job. Throughout the book, these letters will keep cropping up to advise us of where the Clave is in their plans and just exactly what the Consul is thinking without making him a major POV character. It was a really interesting device, and I think it worked really well. If you were expecting all the feels with this book, though, you’d be right. There is not one character mentioned who doesn’t rip at your heart strings. (I know the cliché is tug at your heart strings. This is way too tame for this book.) Even Gabriel Lightwood realizes he has a soul. The relationship between Will, Jem and Tessa continues to build, to the point where I almost couldn’t stand the idea that she would pick one over the other. But more on that later. The plot was pretty good in this one, if a little over laden with dialogue sometimes. The most gorgeous moments in this book do occur through dialogue, but even I wished sometimes that somebody would just kill something. At the same time, the amount of character development was striking and I would have hated to not have had a moment of it. But just don’t expect all that much action. So I know the big thing here is: who does she end up with? Well, I’m not going to tell you, obviously. I WILL tell you that if you want to be surprised by the ending, don’t get curious as to why the inside of your hard cover book jacket sparkles. There’s a family tree in there that tells you all you need to know and I looked at it way too soon. This is mostly for my folks who’ve already read the ending and want to know what I think, but without spoilers so those of you who haven’t can try to puzzle it out. I thought the ending was heartbreakingly perfect—until the epilogue. I’ve read Cassie’s explanation for why she added the epilogue, but I’m still not sure I like it. On the one hand, the romantic in me finds it absolutely perfect. On the other hand, the reasoning that led Tessa to make her original decision just broke my heart in all the right places. It said so much about the beauty of their whole relationship. I may have died inside when she made the choice, but I probably could have come to grips with it a lot faster than this whole epilogue thing. This review has already gone on way too long, but I had to make this a perfect send off. 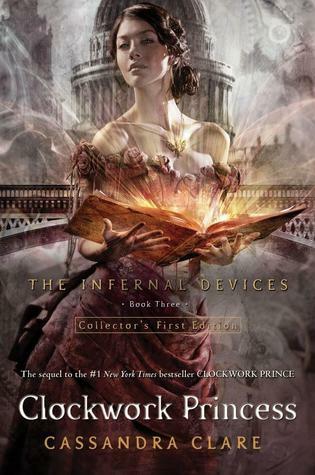 I will always love The Mortal Instruments, but the level of writing in The Infernal Devices is just off the charts. I love the characters in TMI, but the TID characters just break my heart, and I can’t stand to see them go. Thank you for a breathtakingly beautiful story, Cassie. I have to go cry again now.